The Tenerife Cosmic Microwave Background (CMB) experiment is mapping a region of 5000 square degrees on the sky. Several beam-switching radiometers at frequencies 10, 15 and 33 GHz have been operating in the Teide Observatory (Tenerife) for more than ten years. Our experiment discovered the first features in the CMB in a strip at Dec.=+40°. 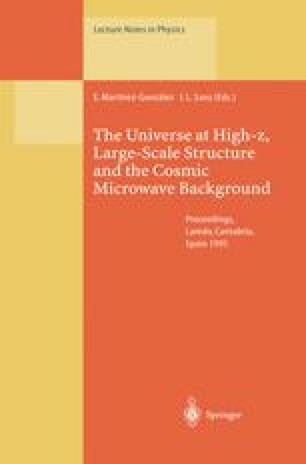 The region analyzed was free of strong radio sources and the spectral properties of the features ruled out the possibility of a Galactic origin. The most probably origin of the singal detected was cosmological, representing the first direct observation of intrinsic CMB structure. For the case of fluctuations described by a Gaussian auto-correlation function, a likelihood analysis of our combined results at 15 and 33 GHz implies an intrinsic rms fluctuation level of 48 −15 +21 μK on a coherence scale of 4°; the equivalent analysis for a Harrison-Zel'dovich model gives a power spectrum normalisation of Q rms-ps =22 −6 +10 μK. A comparison with the COBE DMR two-year data at Dec.=+40° shows the compatibility of the signal detected by both experiments and the presence of individual features common to both data sets. Several new instruments recently installed in Tenerife extending the angular scales and spectral range covered by our radiometers are briefly described.